Kernis, despite being amongst the least symphonically inclined of composers, has two symphonies to his credit. The other was also recorded by Argo and then pretty promptly deleted. Those Argo discs have now been released from remainder-world, e-bay and second-user purgatory by Phoenix. Mark Swed�s 1991 liner notes have been kept and we now have updated artist and composer profiles. Kernis makes no secret of regarding the symphony as �an outdated and irrelevant form� but staring down its challenging gaze he has found something to hold the heart, ear and mind. The First Symphony is in five movements of which the first Continuous wave has an irrepressible cell-iterative and bell-evocative drive recalling Glass symphonies 2 and 3 and Nyman at his most rhythmic and driven. The little scherzo is a thing of insect noises and soloist lines that aggravate and fascinate. It rises to a wild nodal point and fades brutally with the start of a piano riff. Still movement (III) is at first more harsh, unyielding and dismal. It recalls the symphonies of William Schuman�s 1960s and 1970s. When the clamour has died away we enter a glistening Bergian world before oppression and steely Gothickry returns only to fade down into exhaustion. A silvery massed violin dance smilingly equates with similar moments in Alan Hovhaness�s symphonies.� Kernis�s finale plays with pointillism but locks itself into a sort of tensely effervescent euphoria linking back to the Glass-Nyman atmosphere of the first movement and adding a Beethovenian ecstasy. 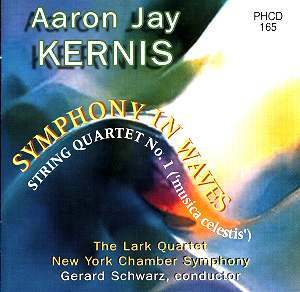 Another form you may not instantly associate with Kernis appears in his 1990 String Quartet No. 1 written for the forces that recorded it here. It was commissioned by the Walter W. Naumburg Foundation. It is in four movements of which the first makes life-enhancing play of his trademark ebullience cradled in a Ravelian skein. The second movement sounds reverent and rapt � almost Finzi (Introit) and Suk (St Wenceslas). It is the movement that lends its name to the title of the quartet as a whole: Musica Celestis. The superbly ear-trickling little scherzo combines Russian dance with a Gaelic foot-tapper. A jittery animated finale, chitters, stabs, accelerates, riffs, fugues and generally sets the adrenaline running. Another winner from Phoenix and Kernis. Let�s hope we soon hear more from this composer.